I never thought that I would be in for a holiday in Vietnam because it's so underrated that people's perception of it is usually "not as good as Thailand" if you're into cheap eats and shopping. 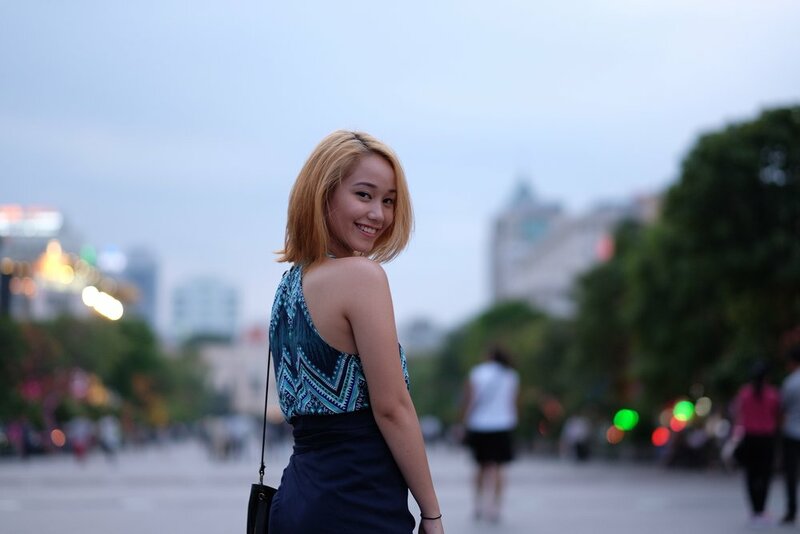 With many thanks to IGersMalaysia, I was in for an adventure in Vietnam with Mon. Every tech savvy 21st century human being would be on a search for a sim card with data the moment they touchdown in a foreign country. I was surprised that Vietnam had such cheap packages at the airport itself. I got a 5GB data only package for RM25, I was shocked! We got a shuttle from the airport to our small boutique hotel in the streets of Ben Thanh. Blue Diamond hotel is a very elegant in design yet affordable for a budget traveller. After checking in, we headed straight to the eateries. 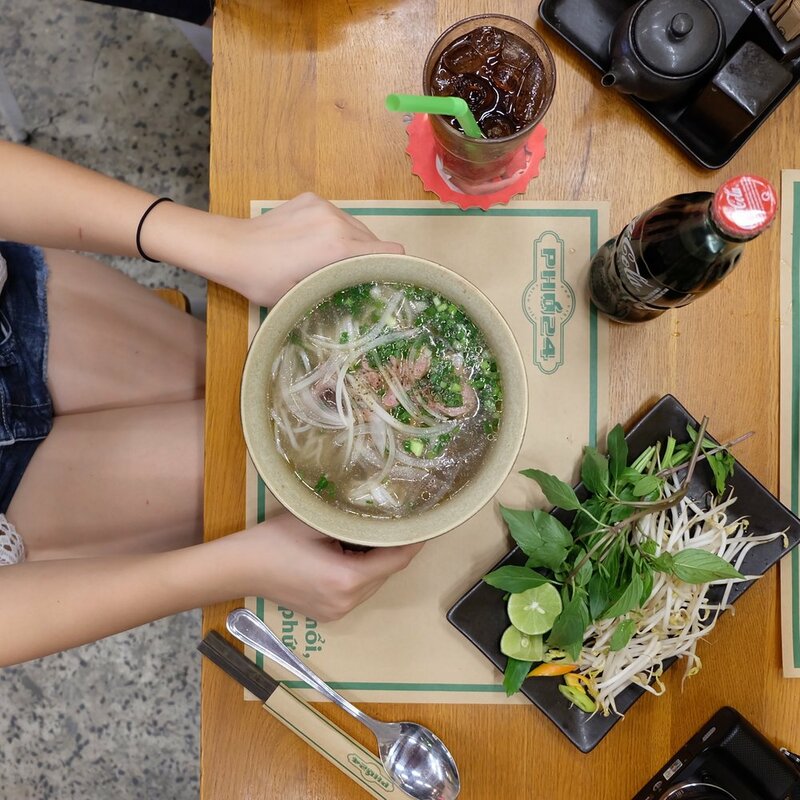 In Ho Chi Minh City, Pho 2000 is one of the two recommended traditional pho restaurants. Although it was recommended, I thought that broth was slightly bland compared to pho I've tasted in Vietnamese restaurants in KL. A hot afternoon called for some sweet treats and coffee in a cosy cafe. A Vietnamese version of Starbucks located right opposite the famous Ben Thanh market. We hid in it for a bit till the sun went down to explore further. Just a heads up that mooncakes around the world pretty much tastes the same so there's not much point except for picture taking. Ben Thanh market is a huge market filled with souvenirs, hawkers, florists, vegetable stalls, meat stalls and more. You can literally find everything you need and have a taste of Vietnam in here. Things I'd recommend you doing in this market are to shop for souvenirs because there a lot of stalls selling similar goods that are priced differently. Bargaining helps get you the cheapest price for whatever you're looking for. Things I wouldn't recommend is eating there unless you know a specific hawker you know of that sells good and fresh Vietnamese treats. Aside from that, being there in the evening may have affected our experience as well because the spring rolls we had were all dried up and soggy. Decided to skip dinner and had a few drinks at Air 360 Skybar. You'd be surprised how vibrant the nightlife here in Vietnam is. It was a typical ladies night and we had free cocktails for the night and a few beers on ourselves. A tall tower located in the middle of the city centre that had a beautiful 360 view of Ho Chi Minh city. The bartender was also very talented in making drinks, constantly juggling a 1L bottle of liquor with a shaker while making our cocktails. A DJ and live band was also there to entertain us for the whole night. The next morning, we decided to go cafe hopping around the city. You'd be surprised how cool these hipster cafes are and not to mention good food to go with. One of the cafes on our list was The Loft. There are two branches in the city and we decided to make our way to both of the branches for picture taking as the ambiance for both is very different. Within walking distance, there's a lot of key tourist spots that you ought to visit. From the Saigon Notre-Dame Basilica to Buu Dien Saigon. Classic architecture dated from way back with beautiful interior. Many come here for wedding and touristy photos. The next day, we explored the city centre where popular cafes, shops and high end malls lit up the entire place. One of the places I really wanted to explore was this building facing the city centre that you definitely wouldn't miss when you're there. It was filled with different themed cafes and shops from floor to floor and door to door. My next visit for sure! The famous statue of Ho Chi Minh himself standing tall in the middle of the city square. This place is a popular place for people to gather on weekends to just chill by the fountains for a picnic and enjoy street performances. This is one of the famous eateries for authentic Vietnamese food in the streets of Bui Vien. A street similar to Changkat in Malaysia that has bars and mini street stalls selling food. Bun Cha 145 Bui Vien is a small restaurant located along the streets. Long lines usually await those who want a taste of the goodies but I swear it's worth the wait. Dishes you ought to try is the Bun Cha and Grilled Beef Wrapped in Guise Leaves. Just opposite the restaurant is tis mini seafood stall that was packed with people just chilling by the roadside having grilled seafood. One of the many things I love about Vietnam is that its' seafood is massive in size and yet the price is so low compared to the portion. Grilled pork and seafood while having a bottle or two of beer. Watching the night come to life in Vietnam was such an amazing experience. On our last day, we decided to book a day tour to Chi Chi Tunnels to explore the history of world war. An amazing experience that involved us getting into tiny tunnels and witnessing the traps they used to trap American soldiers back in the day. We paid extra to play with some of the AK47s'. Who knew shooting could be such a scary experience. The loud bang and the reflected impact startled me quite a bit. Thank god for the ear muffs! Lunch was at an outdoor food court near our hotel and Ben Thanh market. There was a good amount of variety to the food they served and for its price, the quality and taste of it was not bad. Dinner was at the other recommended pho restaurant in the city. Pho 24 was hands down the best pho I had in Vietnam. This one over Pho 2000! It's a chain restaurant that served fast food version of pho but the broth was so seasoned and the meal was so fulfilling. One last night called for bar hopping. We went to Glow, another famous rooftop bar/club for happy hour. A very nice place to chill but I would imagine it to be an even better place to party but we didn't stay throughout the night. Another reason I'd recommend anyone who loves a good night filled with good music to stay at the streets of Ben Thanh is the fact that it's walking distance to all the hotspots in the city. My favourite part of the stay was this basement bar/club right opposite our hotel. While we were on the way back to our hotel to call it a night, we heard music playing from this basement across the street. Being the curious girls that we are, we made our way to the bar/club and found a whole new world. Good R&B, hip hop and a hint of EDM music filled the room. Bottle prices were cheap because VIETNAM. The bartenders were super friendly and we made friends from Hong Kong that night too! It was very memorable for the both of us. So thankful to have had a chance to explore Vietnam with my girl, I'd definitely say it's the new Thailand and it's so underrated you'll love it! Big love and thanks to Air Asia, IGersMalaysia and Digi! Watch it in visuals on my travelogue!